Fried chicken is so popular because of its taste and is a hot and cold plate snack. It is often a part of the menu in the wedding ceremony or any other party as well. 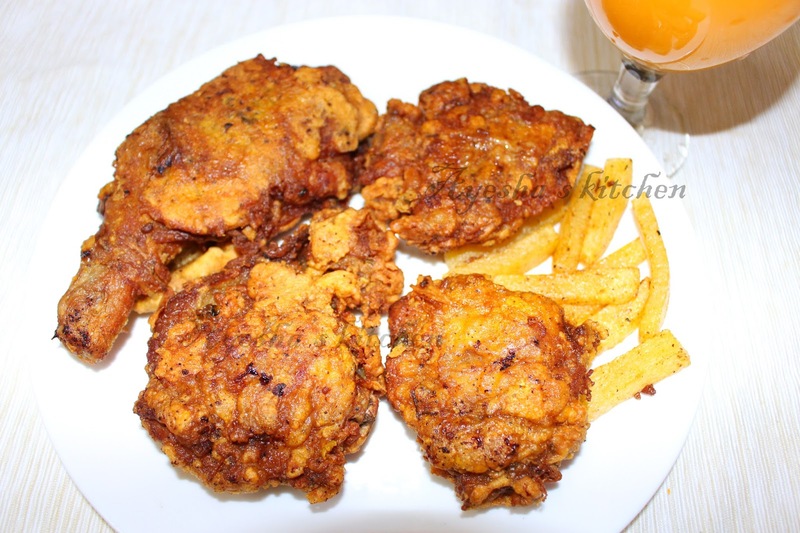 This is my simple recipe showing how to make fried chicken or Broasted chicken at home. Trust me, I made this in only 35 minutes ( preparation plus cooking time ). It turned out really really well. It is verv crispy, soft, yummy with a tempting smell. I didn't used any store bought broast powder for making this Broasted chicken as well. No need of any extra flavorings, only with the common spices available in the kitchen we can prepare this perfect Broasted chicken or chicken broast. 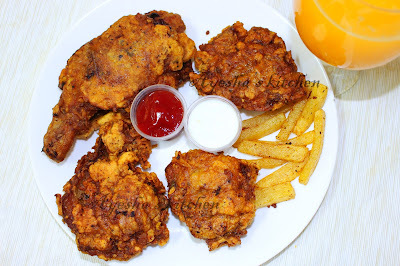 So lets see the recipe of the best tasty crispy soft fried chicken..
Wash and drain the excess water from chicken by squeezing it several times. Make slits with a knife. Mix well, the chicken marination ingredients and make a paste. Marinate the chicken and keep it aside. Mix the egg and curd with a whisker and set aside. Now in a separate bowl mix in custard, plain flour, cornflour, white pepper, and salt. keep it aside. Heat oil in a nonstick vessel (oil must cover the chicken). When hot, take a marinated chicken, dip in the egg mix and then coat with the flour mix and then put in the hot oil. While mixing in the flour batter, just squeeze the chicken with flour, so that the flour evenly mix with the chicken. Fry each side in a medium flame. Do not fry over a high flame, as it will make the crust burnt leaving an underdone chicken. Drain it to a tissue for removing excess oil. Once the chicken is done, it will be crispy but after few seconds it will become soft. Serve hot with french fries, garlic sauce, and tomato sauce.